"I will speak ill of no man and speak the good I know of everybody." If you or someone you know is being bullied please be sure to report it to your school. You can report it to your child’s teacher, principal, or counselor, or there is a form on your school’s website under Counselor’s Corner tab you may submit. Approximately 40% to 80% of school-age children experience bullying at some point during their school career. Bullying can affect you in many ways. You may lose sleep or feel sick. You may want to skip school. If you are feeling hopeless or helpless or know someone that is, please call the LIFELINE at 1-800-273-TALK (8255) . Bullying can be defined as unwanted, aggressive behavior among school aged children that involves a real or perceived power imbalance. The behavior is repeated, or has the potential to be repeated, over time. Bullying has a negative effect on the social environment of schools, creates a climate of fear among students, inhibits the ability to learn, and leads to other antisocial behavior. Other detrimental effects of bullying include impact on school safety, student engagement, and the overall school environment. Oklahoma state law declares that any form, type, or level of bullying is prohibited, and that every incident of behavior that may constitute bullying should be taken seriously by school administrators, school staff (including teachers), students, and parents. Bullying has serious and lasting effects. 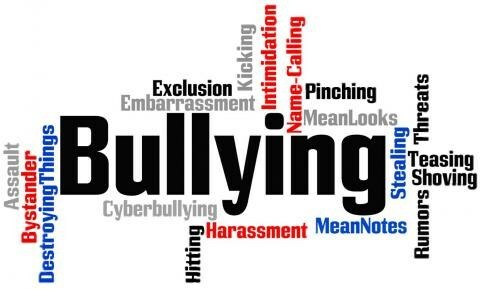 Research has found bullying behavior causes increased mental health problems, increased thoughts of suicide, retaliation through extremely violent measures, decreased academic achievement, higher risk of abusing alcohol and other drugs, and truancy. What are the warning signs of bullying? Reluctant to go to school or certain places. Silent about what is happening at school. Frequent lost or damaged possessions. Quiet, depressed, irritable, or anxious. Gets into physical or verbal fights with others. Has extra money or new belongings that cannot be explained. Disrespects authority and disregards rules. Has an attitude of superiority. Needs to have power or control over others. Help kids understand bullying. Talk about what bullying is and how to stand up to it safely. Tell kids bullying is unacceptable. Make sure kids know how to get help. Keep the lines of communication open. Check in with kids often. Listen to them. Know their friends, ask about school, and understand their concerns. Encourage kids to do what they love. Special activities, interests, and hobbies can boost confidence, help kids make friends, and protect them from bullying behavior. Model how to treat others with kindness and respect. Kids who know what bullying is can better identify it. They can talk about bullying if it happens to them or others. Kids need to know ways to safely stand up to bullying and how to get help. Encourage kids to speak to a trusted adult if they are bullied or see others being bullied. The adult can give comfort, support, and advice, even if they can’t solve the problem directly. Encourage the child to report bullyingif it happens. Talk about how to stand up to kids who bully. Give tips, like using humor and saying “stop” directly and confidently. Talk about what to do if those actions don’t work, like walking away. Talk about strategies for staying safe, such as staying near adults or groups of other kids. Urge them to help kids who are bulliedby showing kindness or getting help. Watch the short webisodesand discuss them with kids. What is it like to ride the school bus? What are you good at? What would do you like best about yourself? What does “bullying” mean to you? Describe what kids who bully are like. Why do you think people bully? Who are the adults you trust most when it comes to things like bullying? Have you ever felt scared to go to school because you were afraid of bullying? What ways have you tried to change it? What do you think parents can do to help stop bullying? Have you or your friends left other kids out on purpose? Do you think that was bullying? Why or why not? What do you usually do when you see bullying going on? Do you ever see kids at your school being bullied by other kids? How does it make you feel? Have you ever tried to help someone who is being bullied? What happened? What would you do if it happens again? Get more ideas for talking with childrenabout life and about bullying. If concerns come up, be sure to respond. There are simple ways that parents and caregivers can keep up-to-date with kids’ lives. Read class newsletters and school flyers. Talk about them at home. Teachers and school staffalso have a role to play. Help kids take part in activities, interests, and hobbies they like. Kids can volunteer, play sports, sing in a chorus, or join a youth group or school club. These activities give kids a chance to have fun and meet others with the same interests. They can build confidence and friendships that help protect kids from bullying. Kids learn from adults’ actions. By treating others with kindness and respect, adults show the kids in their lives that there is no place for bullying. Even if it seems like they are not paying attention, kids are watching how adults manage stress and conflict, as well as how they treat their friends, colleagues, and families.